There are many local advocacy groups in the Dallas-Fort Worth region that help promote safe bicycling. These groups include non-profit “Friends of The Trail” organizations that promote and enhance bicycling, educate residents about safety, organize community support for trails and promote the image of a bike friendly city. Click here for more information. “It’s an opportunity to make your community a vibrant destination for residents and visitors — a place where people don’t just live and work, but thrive. There are many benefits in being recognized as a BFCSM through The League. 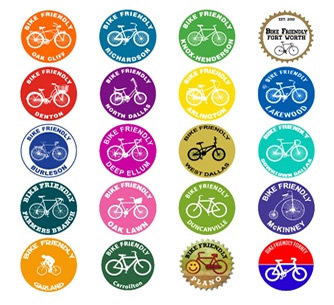 Receiving a designation of Platinum, Gold, Silver or Bronze can help gauge where the community or city stands in regards to bicycling in the region and around the country. According to The League, the application process “will help your community create new partnerships and momentum for bicycle improvements, allow you to gather essential bicycle-related data in one place, and the result will show your political leadership how their community stacks up against similar communities all over the nation.” Each applicant comunity will receive customized feedback and technical assistance. The League of American Bicyclists’ also formally recognizes institutions of higher education for their efforts in promoting a bikeable campus. Similar to becoming a Bicycle Friendly Community (BFCSM), being recognized as a Bicycle Friendly University (BFUSM) can provide many benefits. The League notes that “Colleges and University campuses are unique environments for their high density, stimulating atmosphere and defined boundaries.” These characteristics make them an ideal environment for bicycling. Some of the benefits highlighted by The League include, environmental, economic and health benefits for both students and the institution as a whole. Also, universities can save money by decreasing the demand for vehicular parking.